Sydney - South Africa will be looking to play leg-spinner Imran Tahir and opt against playing four specialist pace bowlers in Friday's opening Test against Australia, a team coach said on Monday. Tahir proved expensive in the Proteas' drawn three-day tour match with Australia A, finishing with two for 157 off 40 overs and going at close to four runs per over on a placid Sydney Cricket Ground pitch last weekend. Despite Tahir's modest return and the impressive showing from Rory Kleinveldt, the paceman is likely to miss out on selection for his first Test, assistant coach Russell Domingo said. The bouncy Gabba wicket generally favours pace bowling, but Domingo said South Africa would resist the temptation to unleash a full pace battery against the Australians in Brisbane. Morne Morkel, rested from the Australia A match, is expected to return to the Proteas' line-up, joining the world's top two ranked bowlers Dale Steyn and Vernon Philander, while star allrounder Jacques Kallis (flu) will also be back. Tahir made his Test debut against Australia in November last year, and has now played 10 Tests, taking 26 wickets at an average of 40.19. "To be honest with you, the balance of the side with Kallis being there as the fourth seamer, whether you play four or five (fast bowlers) isn't really going to be that important," Domingo told reporters. "I think we'll always look to have a spinner in the side. "Gone are the days when a South African team goes without a spinner." That means Kleinveldt, who was only shaded by Steyn as the best bowler of the Australia A match and had figures of two for 60 on the lifeless pitch, could be the odd bowler out in the Test series. 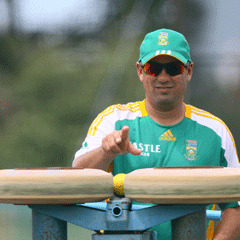 "(Kleinveldt) bowled really well," Domingo said. "He's been very impressive in domestic cricket for a while and he's been superb in our preparation this week." The Proteas said there were pleased with Tahir's preparation, despite his limited success against Australia's second-string batting lineup. "Imran got a long bowl which is exactly what we wanted," said batsman Hashim Amla.